Baltic Slurry Acidification project partner Br Göransson has invested in SyreN slurry acidification system for In-Field usage. The inauguration of the equipment was done in Sweden’s biggest agricultural fair for professional farmers, Borgeby Fältdagar, in 29th of June. The event gathered 20 000 visitors from all over Northern Europe. 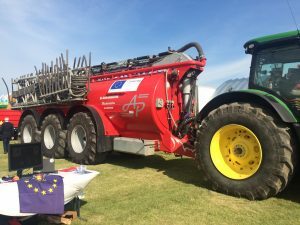 Before starting the real work in fields, the equipment will be taken to a road trip to another agricultural fair, Brunnby Lantbrukardagar and to separate farms to give a demonstration. Back in Br Göransson’s farm in Kvidinge, Sweden, SyreN system will be used mostly for subcontracting. Thus the farmers in the area will be able to test the benefits of in-field slurry acidification.